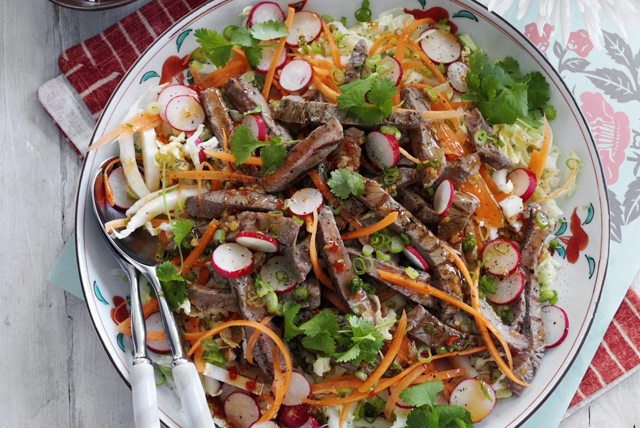 Based on a Thai spicy beef salad, this main-dish salad is perfect for a summer get-together. Filled with crisp fresh veggies and topped with grilled tender beef, this salad is both satisfying and refreshing. If you're looking for a show-stopping salad recipe to serve at your next summer gathering, look no further! Mix barbecue sauce and 1/2 tsp. crushed pepper. Grill steak 8 to 10 min. or until medium doneness (160ºF), turning after 5 min. and brushing with barbecue sauce mixture for the last 2 min. Remove steak from barbecue; cover loosely with foil. Let stand 5 min. Meanwhile, toss lettuce with vegetables; place on platter. Cut steak across the grain into thin slices; arrange over salad. Mix dressing with remaining crushed pepper; drizzle over salad. Sprinkle with cilantro. Substitute 1 finely chopped bird's eye chili for the crushed red pepper, mixing half with the barbecue sauce and remaining half with the dressing before using as directed. Serve with 2-2/3 cups of your favourite hot cooked grain, such as quinoa.